1st Place Team - Genesis Timber (L-R): Reece Borklund, Ladon Messer, Matt Webb and Joshua Light. Webb also won the Flush 'N Flurry prize cooler. View more event photos and videos. 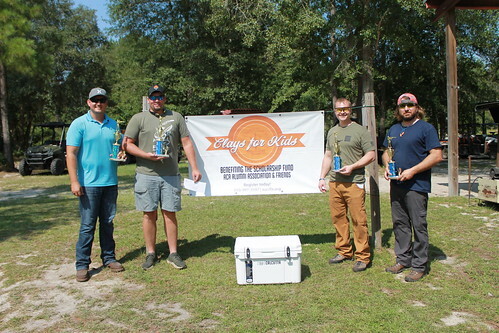 The Aucilla Christian Academy Alumni Association raised $6,000 for area students to receive need-based scholarships to attend ACA through the association’s fifth annual ACA Alumni and Friends’ Clays for Kids clay shoot. This benefit was held on August 25, 2018 at Southwind Sporting Clays in Quitman, Georgia, and was presented by Staunton & Faglie, PL. Winning first place at the event was Genesis Timber, followed by Camlocker in second place and the Rusty Hamrick team in third. The best overall male and youth shooters at the event were Wyatt Hargrove and Brewster Bass. Matt Webb won the Flush and Flurry cooler prize, donated by Waukeenah Fertilizer. Other corporate teams sponsoring the event were: Big Bend Timber Services, Big Bend Tire, Broadleaf Trucking, Burnette Roofing, Camlocker, Capital Truck, Demott Family Farm, FMB, Southeastern Enterprises and Vascular Surgery Associates. Participants and their guests were treated to a delicious BBQ lunch with an assortment of desserts prepared and served by the ACA Alumni Board. ACA Ambassadors assisted as trappers and in the kitchen serving, and participants went home, not only with wonderful memories, but also with an assortment of door prizes and an event souvenir cup. “We appreciate everyone who supported our event so very much!” said Cassie Davis. To view photos of the event, click this link or the photo below. For information on participating in the event next year, please contact ACA Director of Development Lisa Flournoy at 850-997-3597 or lflournoy@aucilla.org. 2nd Place Team - Camlocker (L-R): Kyle Rogers, Clay Skiver, Jake Edwards, and Chason Ives. 3rd Place Team (L-R): Rusty Hamrick, Michael Clark, Wyatt Hargrove, & C.C. Collins. Top Male Shooter Award Winner: Wyatt Hargrove. Top Youth Shooter Award Winner: Brewster Bass.